Web Help Desk provides a set of predefined reports. You can use these reports as they are, or modify them to meet your needs. The following example makes changes to the Assets with most Tickets for the last quarter report. 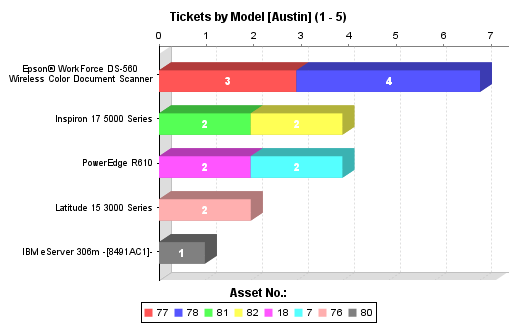 By default, this report shows the number of tickets for each asset during the past quarter. This helps you identify individual assets that generate a large number of tickets. Instead, the report will be modified to show which asset models generate the most tickets, and to show the information for the previous month. On the Report Details tab, change the Bar Category from Asset No. to Model. Each bar will represent an asset model instead of an individual asset. For the Bar Stack Category, select Asset No. This subdivides each bar by individual assets to identify individual assets generating more tickets than others with the same model. Click the Report Filters tab, and then click the name of the existing filter to open it. Change the Time Range to include only the previous month. Click the Report Basics tab, and then change the name of the report to reflect its new contents. The bars represent asset models, and the subgroups in each bar represent individual assets.